The Andrea Dailly-trained Heston Bale has achieved the unthinkable and smashed Sandown Park’s 515 metres track record in just his second race start at just 23 months of age. 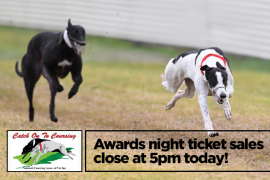 SANDOWN Greyhound Racing Club will this week host a rare Saturday night meeting. Saturday night racing is normally held at The Meadows in Broadmeadows, but due to significant track works, the meeting has been transferred to Sandown.